“This webinar will focus on understanding and treating the complexity and heterogeneity of suicide. Presenters will discuss how using a mechanism-based approach to understand suicide can lead to better treatment. This presentation may be of interest to a wide range of groups including psychiatrists, psychologists, social workers, nurses, and other mental health professionals,” says NIMH. The webinar will feature presentations from APS Fellow Matthew Nock and psychiatrists Lisa Pan and David Brent. Click here to register for the April 12, 2019 webinar, which will run from 12:30 – 1:45 PM EDT. Want to learn more about RDoC? Be sure to catch the “Ask Me Anything (AMA”) session on RDoC at the 31st Annual APS Convention in Washington, DC this May. 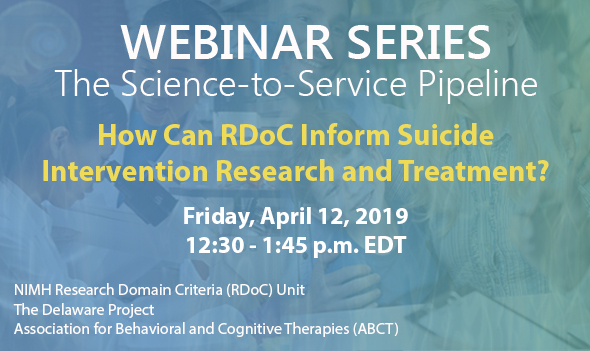 Policy > NIH Webinar: How Can RDoC Inform Suicide Intervention Research and Treatment?